It's never easy asking for financial assistance from anyone, especially family and friends, but in the seven years since I posted the first episode of Matt's Basement Workshop a lot of things have changed. Recording equipment, cameras, hosting services, shop set-ups and even the tools and projects I've used and built over that same time. The one thing that hasn't changed is the generosity and appreciation from the viewers and visitors of the show. I'm still uncomfortable asking for assistance in such a manner as this, but I know from previous experience, I've always been amazed by the heart-felt support and reaction whenever I've needed help. While my camera and audio equipment has undergone significant changes the most important piece of the show, the website, hasn't had a significant change in quite a long time. That's the reason for this fundraiser. In order to create an amazing destination for the audience to visit I need to raise the money to hire someone who can take my existing site and transform into something much more user friendly. A place where visitors can find the content they're looking for much easier, a site that's far more uncluttered than the current and one with plenty of room for upgrades and expansion as new and better ideas for interaction with fellow woodworkers arise. I've already talked with someone who can do just THAT and can't wait to get started! Level 1 - $5 - Your $5 donation gets your name posted as a contributor in the show notes for the walk-through video. My way of saying "Thank You" and letting others know you helped to make this much more improved website happen. Level 2 - $10 - Your $10 donation gets your name posted as a contributor in the show notes AND included in the credits at the end of the video. Level 3 - $50 - Your $50 donation includes the same as Level 2 plus you get a "Your brain on Matt's Basement Workshop" t-shirt to wear proudly the shop or wherever you need to look your best. Level 4 - $100 - Your $100 donation includes the same as Level 3 plus a "468x60" banner ad for your personal message, your company or whatever you want to promote (family friendly only) during a month of your choosing after the new website goes live. Level 5 - $200 - Your $200 donation includes the same as Level 3 plus a "Sponsorship" ad spot in the videos released during the month of your choosing after the new website goes live. A great opportunity to get your personal message, your company or whatever you want to promote (family friendly only) out to the people that can appreciate it the most. Thank you for taking the time to check out this fundraiser video and what I have to offer in exchange for your help. Even if you can't donate at any level, I truly appreciate your visiting the site as often as you have. "Straight Grains & Sharp Blades"
Just a quick update regarding the wildly successful "New and Improved MBW Podcast Website" campaign. Thank you again to all who donated and helped push me up and above my original goal! I can't express how much I appreciate what you've done for me. As of this upcoming Sunday, Feb. 24 2013 I plan to stop taking donations from this fundraiser. So if you would like to make a donation please do so before than to qualify for one of the reward levels I have to offer. After that, I'll still be accepting donations via PayPal...afterall how can I turn down your generosity CHORTLE? WOW!!! I don't remember if I mentioned this but thanks to all of you the amount of money raised has already doubled the original goal. The official end date is next week. Thank you, thank you, thank you for your generosity. Saturday afternoon will mark the second full week of this mind-blowingly successful fundraiser. Within a matter of a few days the official goal was reached, and now your generosity is taking me to within a few dollars of doubling that amount. And what blows me away the most is that this was all done in less than half the time the entire campaign was scheduled to run! Thank you! For those who have already donated at the T-shirt level and above, as soon as I officially close the campaign you'll be hearing from me to get sizes and addresses and also to make arrangements for as needed. Thanks again everyone...I'm so thankful for all of your generosity! It's now officially been a little more than a full week, (not quite halfway through the entire 30 days the fundraiser was originally planned to run) and I've almost reached the 200% funded mark!!! My goal is to end the fund-raiser by next Monday, a full two weeks early, and hopefully by then we'll have doubled the original goal. If it comes up a little short, I'll still be amazed and flabbergasted by the outpouring of support...but if it meets or exceeds that 200% mark...I'll be speechless...something that doesn't come easy for me LOL! Your name posted as a "Friend of MBW" in the show notes for the walk-through video. My way of saying "Thank You"! Your name posted as a "Supporter of MBW" in the show notes AND included in the credits at the end of the video. 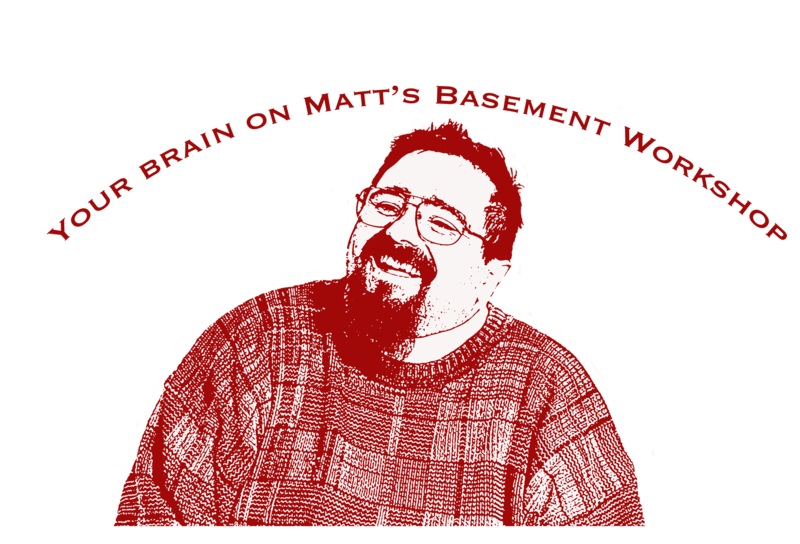 Same as Level 2 plus you get a "Your brain on Matt's Basement Workshop" t-shirt to wear proudly in the shop or wherever you need to look your best. Same as Level 3 plus a "468x60" banner ad for your personal message/your company/whatever you want to promote (family friendly) during month of your choosing. Same as Level 3 plus a "Sponsorship" ad in the videos released during the month of your choosing after the new website goes live. Thank you for sharing your hobby with all of us. Between Matt’s Basement Workshop and Wood Talk you keep me entertained and thinking about woodworking during my work day.